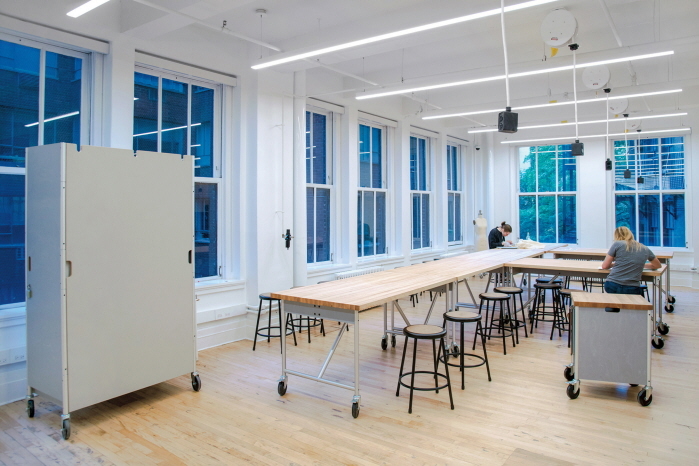 Milder Office Furniture is a contemporary furniture design and production company based Brooklyn and Philadelphia. We offer smart furniture solutions for the office, library, school and dorm environments. Our strength is customization. Our furniture products are built to order, and can be customized to meet your particular needs, specifications and budget. Milder Office Furniture is a contemporary furniture design specializing furniture for offices, libraries and and learning spaces. We can work with you (the end user), your architect or furniture dealer. The Milder Office Furniture System includes a range of tables, workstations, partitions and storage options. We offer trade discounts of up to 40% off list and competitive lead times. LEEDS compliant. Made in the USA with offices in Brooklyn and Philadelphia. The Milder System is based on a vocabulary of work surfaces and storage units. All our products are constructed of integrated and compatible components.The primary material is durable pre-finished birch plywood from Finland. Vertical supports and connectors are brushed and clear anodized aluminum fitted with our distinctive end cap. Designed in New York. Made in New York. We offer trade discounts of up to 40% off list and lead times of 6-8 weeks depending on project scope. LEED compliant (20 points). Visit our site milderoffice.com to see our full set of workstations, desks, storage units, bookcases, library furniture, conference tables, pedestals and credenzas. We create space around your work. We specialize in furniture for the office, school and library. Made in the USA. We provide smart, durable and sustainable solutions (LEED 20 points).